We are starting the new year off with some mini goals. We are making an effort to not only bring lunches to work but also make them interesting and healthy; no boring sandwiches here. I had some inspiration after watching a video from Tasty on Buzzfeed. 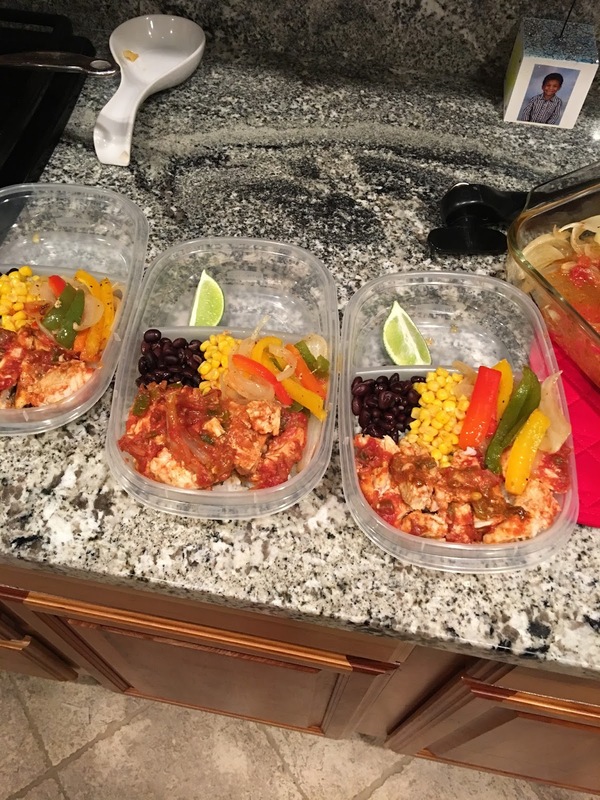 They posted a video on how to make chicken burrito bowls and they looked amazing. We modified the recipe to fit what we had on hand and they turned out great. We very easily made 4 pre made lunches for the week that are healthy and delicious. Here is what we did. cut up the chicken and add to your favorite lunch container over rice. Add your any of your burrito favorites; black beans, corn, pico de gallo, guacamole or cheese. You can divide this up into four different lunch containers and voila, easy healthy lunches for the week! Thinly slice peppers and onions. 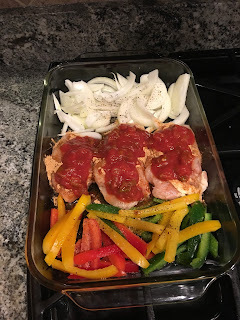 Place Chicken breasts in the center of a 9x13 baking dish, place peppers on one side of chicken and onions on the other side. Pour olive oil over chicken, peppers and onions. Coat the chicken with the taco seasoning (both sides). Pour salsa over chicken. Place in 400 degree oven for 20 minutes. Let cool, slice chicken and divide chicken peppers and onions into 4 lunch containers over a small bed of rice. Find the step by step video here!